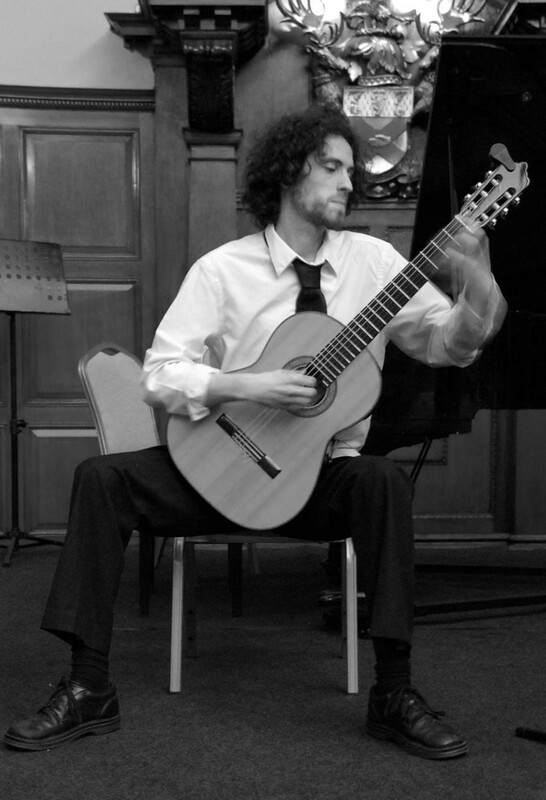 Eoin Flood is regarded as one of the most exceptional classical guitarists of his generation, performing widely across the US, UK and Ireland and recently invited to perform at the International Concert Artist’s Series at the Miller Theatre in New York to great acclaim. It was the studio of Mark Delpriora at the Manhattan School of Music that first attracted Eoin to the city, where he was twice placed on the Dean’s List in recognition of his outstanding achievement in performance and academic studies. Originally from Killiney in county Dublin, Eoin began his music education with Dr. John Feeley at the D.I.T. Conservatory of Music and Drama. There he received his Bachelor and Master of Music degrees in Performance through classical guitar, both with Distinction. Following his MMus, Eoin studied with Marion Hyland (Royal Irish Academy of Music) and Graham Anthony Devine in London, before completing his Professional Studies Diploma in Manhattan. 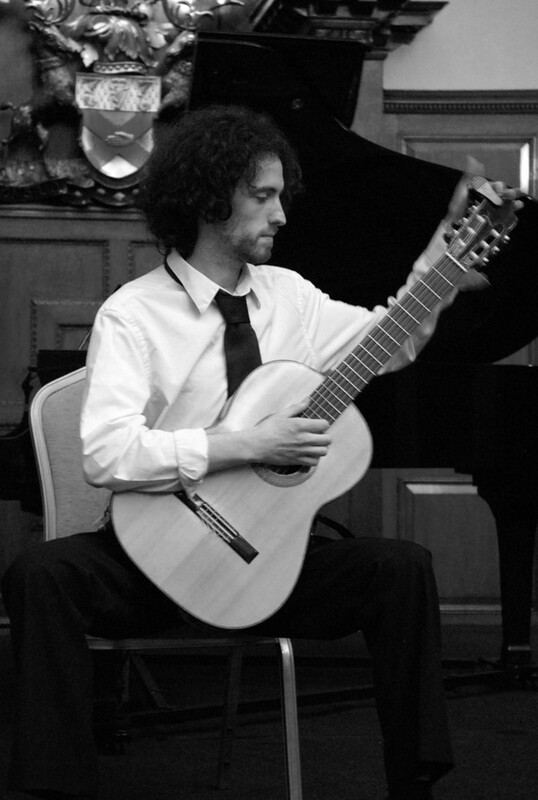 Eoin Flood Classical Guitarist Musicians, Pre-Dinner Music from Dublin servicing weddings throughout the local area including Dublin, Wicklow, Kildare, Meath, Carlow, Laois, Offaly, Kilkenny, and Waterford. 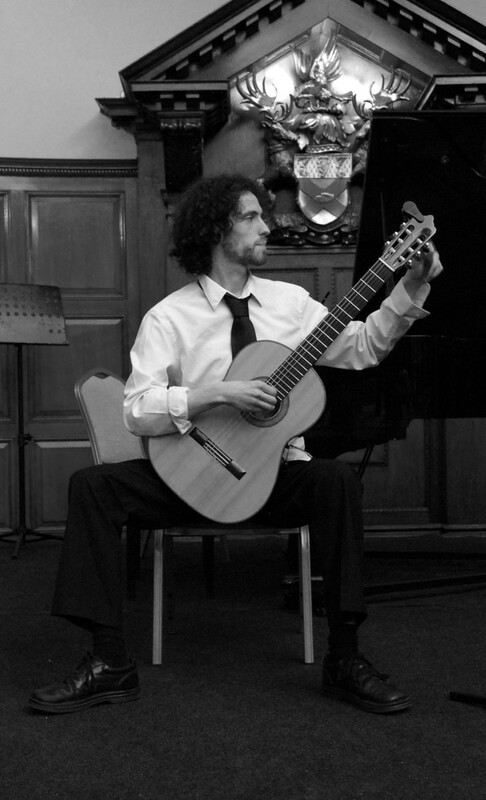 Eoin Flood Classical Guitarist professional Musicians, Pre-Dinner Music that has been part of the Musicians, Pre-Dinner Music industry 2011 specialising in Classical, Traditional Wedding, Spanish, Traditional Irish, Romantic and Popular . Eoin played absolutely beautifully at our wedding. We chose some songs from his website and requested additional songs that he had not listed. There was no problem at all for Eoin to learn and play these and he also offered advice as we wanted an upbeat melody after the ceremony. A number of our guests also complimented the music. Eoin always replied promptly to my emails. I would highly recommend Eoin! 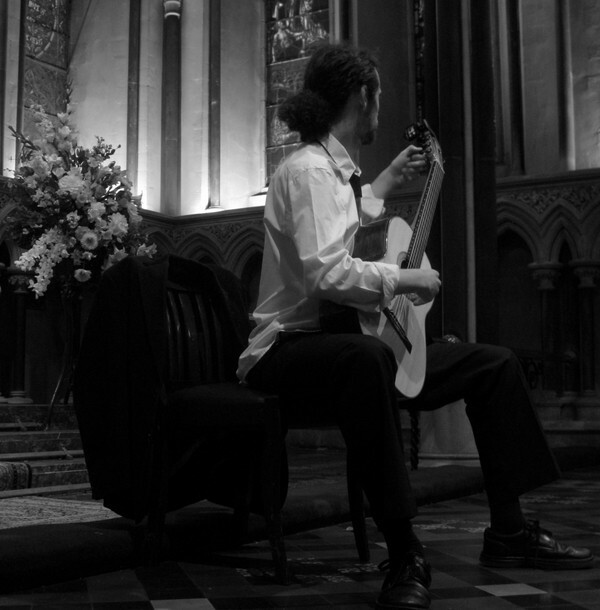 Eoin provided the music for our church wedding and we couldn’t recommend him more. The music on the day was beautiful and created a wonderful atmosphere throughout the ceremony. Eoin was very easy to work with, he took the lead from us in terms of what we wanted but was also knowledgeable and able to provide tips and suggestions where we were unsure. Eoin is a really lovely guy and a very skilled musician. Eoin played our wedding ceremony and we could not have been happier. We were looking to strike a balance between songs that were fitting for the day but not corny or cheesy. We had some ideas but nothing solid. Thankfully, Eoin was very helpful and offered advice that simplified everything. There was never any lag or confusion in any of the communications. The ceremony went off without a hitch and all of the guests were highly complementary about Eoin's performance. I would have no hesitation in recommending him to play your wedding! Eoin played our reception at St. Michan's last year and I could not be more pleased with how everything turned out. I found him a couple months before the ceremony and he was friendly and affordable. Some of these Dublin guitarists wanted a ridiculous amount of money, but Eoin was flexible and reasonable. Not only did he send a list well in advance for us to choose all our songs for the ceremony, but he was on time, and surprised us with an extra song that he and our pastor David performed for our ceremony! 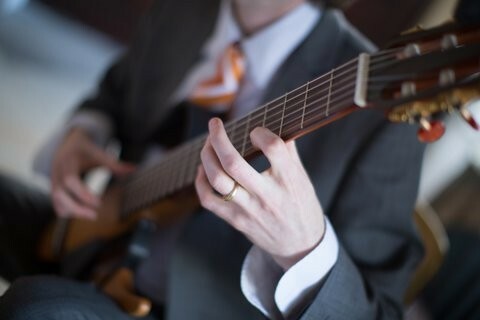 Eoin played for us at our humanist ceremony in August; he was great to communicate with and helped us select pieces that would complement our ceremony. On the day, Eoin played beautifully! We were so pleased with how well everything came together. We highly recommend Eoin! Thanks so much Heather, it was a pleasure to play for your ceremony. Wishing you both the best for the future. Eoin performed the music at our Church Ceremony. On the day itself, the music was beautiful and really added to the ceremony and was very personal to us. Eoin was fantastic to deal with in the lead up to the big day, he was there as little or as much as you might have needed to talk to him and fantastic at giving ideas and tips. He even played a song not on his playlist at our request. We would highly recommend Eoin. We asked Eoin to play both our ceremony and reception music in July 2017 and he was absolutely superb. He was reliable, professional and extremely skilful. We requested a tricky Led Zepplin number, amongst other songs, which Eoin kindly learned specifically for us. Everything sounded fantastic. He truly has a special talent and it was a joy to listen to his music on our wedding day. I cannot recommend Eoin highly enough. Eoin played at our Church wedding ceremony in April. From the first email he was responsive, flexible and friendly. We had chosen quite a few pieces that were not part of his regular repertoire and he was very accommodating about learning the new music. We also asked him to accompany a friend of ours for a few songs and again he could not have been more helpful. We were absolutely delighted with his flawless performance on the day. The guitar sounded so beautiful and really added to the ceremony. I would highly recommend Eoin to anyone! We were so happy to discover Eoin when researching music for our wedding ceremony. Myself and my husband are both music obsessives so this was a really important aspect of the day. Eoin totally understood this and was really encouraging for us to choose the songs we would love and he would work out the rest! It was amazing to have music from our favourites such as Nick Drake and The Band included in the ceremony as well as a couple of more traditional hymns. Eoin made the process really easy and we didn't need to worry about a thing on the day itself. Having done a lot of research around wedding musicians, I think Eoin also offers great value for money, particularly given how talented and experienced he is. Eoin's a real pro. He performed during our ceremony and afterwards at our drinks reception, and he slotted into the proceedings seamlessly based on relatively minimal guidance from us. A last minute request as to how to sync the music and the wording of the ceremony was easily factored in; Eoin and the celebrant sorted it out between them with no need for supervision or coordination from us. His wide repertoire of contemporary, classical, trad and spanish was the perfect mix for our day. However, what really stood out for me was that almost all of the guitar aficionados at the wedding independently and spontaneously mentioned to me how impressive the guitar player was. We were both delighted with our decision to involve Eoin and would readily recommend him to others. Thanks for making one part the proceedings straightforward and stress-free, Eoin! Eoin played at our wedding ceremony and it was beautiful! We found him through other people’s recommendations and after a friendly phone call, we knew we would be in good hands. The ceremony was very atmospheric because of the mix of classical, Irish folk songs, Spanish songs and even some modern songs he learned especially for us. Would highly recommend Eoin, it was a pleasure dealing with him. Eoin was just amazing - I was fairly fussy as I knew the exact pieces I wanted and Eoin was more than accommodating, abridging the pieces to make them fit with the ceremony. The music was really beautiful and made the ceremony so intimate even with 100 guests. He was really quick with responses and I would 100% recommend him to anyone looking for ceremony music! Eoin performed for our ceremony and afterwards at our drinks reception in City Hall. Prior to the wedding we collaborated on the song selection to make the day unique to us which was very enjoyable. Eoin was great to work with and on the day was a seamless part of the ceremony and added thew perfect backdrop to the venue. Highly recommend. I can't speak highly enough of Eoin and everything he brought to our wedding day. He played both our ceremony and pre-reception drinks and was just excellent. There was a musical theme running right through our wedding, we are big music fans along with most of our friends and family and Eoin complimented this perfectly. From the more classical pieces to the more contemporary songs we chose for the ceremony (Heartbeats, Here Comes the Sun and his version of Stairway to Heaven which everybody raved about!!). It was also a big thrill to see my Mam accompany Eoin on violin to play the Lonesome Boatman which he had no problem accomodating. All in all Eoin could not have been easier to deal with, no request was too much trouble with all emails and txts responded to in a very prompt manner. Thanks again Eoin for everything, superb!! We couldn't recommend Eoin highly enough. He has such a wide range of styles that there isn't anything he can't play. We had a random selection of songs and instrumental pieces in mind for our ceremony ranging from some classical Irish pieces and jazz numbers to some instrumental covers from Pearl Jam, The Shins and other movie soundtracks and Eoin managed to cover everything and help us fill the gaps when we weren't sure what to have for certain parts of the ceremony. Not only was he brilliant on the day, but he was so helpful in the run to the wedding and didn't mind liaising directly with our vocalist to take the hassle out of our hands. He also arrived early on the day to practice with her. A true gentleman, professional and a top class guitarist. Eoin played the music for our wedding ceremony at The Millhouse. He was AMAZING and such a pleasure to deal with. We chose a couple of songs from his repertoire but also another of our favorites and he was very flexible with regard to this. I would highly recommend this fantastically talented guitarist! We just wanted to say thank you very much for your playing on our wedding day; 7th August 2014. Your playing was brilliant, and exactly what we wanted. We were both delighted with how perfectly it suited the occasion. A lot of people told us how much they enjoyed it, and complimented how good it was. We of course told them who you were! It was great to hear the pieces we had chosen played so well. It made the ceremony very memorable for both of us, our guests, and Monsignor Ryan. 10/10 - Could not have asked for more. Really helpful in planning and providing suggestions. Extremely flexible even offering to learn new songs if needed. On the day he delivered, made the ceremony really special. A few of our musical friends also very impressed. Defo recommend. Thanks Eoin! After doing a lot of research on-line about various musicians for our ceremony, we went with Eoin and weren't disappointed. Having organised the wedding from abroad, he was always very quick to respond to emails and was a pleasure to deal with. We asked for four songs in particular to be played and nothing was a problem. The music on the day was beautiful and we'd highly recommend Eoin. 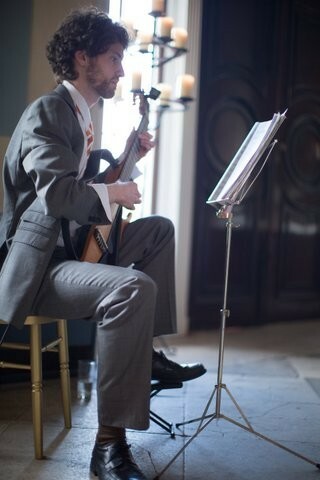 Eoin played guitar for our wedding on May 24, 2013 at Malahide Castle. I asked if he would learn a particular song that I had always wanted to walk down the aisle to. He learned the song, played it beautifully and it made the start of our ceremony absolutely perfect. At the time, I was overwhelmed with too many other things to actually have the time to select the other music myself so we asked him to just play anything he felt was appropriate. Everything he played was lovely and we don't think the ceremony would have been the same with another musician. My husband and I are Americans living in the United States who planned to get married in Ireland. I did all of the arrangements without a planner and thankfully Eoin made setting up the music for our ceremony and cocktail hour absolutely a breeze, he even put together the playlist for us to save us time. Eoin's talent, professionalism, and musical selections were all highlights at our wedding. Thank you again! We celebrated our wedding blessing in the beautiful Adam & Eve Church Dublin on 11th May this year. Eoin played during our service and he was outstanding to say the least. We left the music choice up to Eoin with the exception of one tune. He created a wonderful romantic, relaxed atmostphere. We are planning to have him play for one of future celebrations. Truly an amazing musician! Eoin was really enjoyable to deal with. My niece was the singer at the wedding and was quite apprehensive about it, but as soon as the first rehearsal started with Eoin, she was put at ease. His professionalism and great musical guidance made the whole experience easy. All our friends were so impressed by the music at our wedding and Eoin was key to such a fantastic ceremony. Thanks! 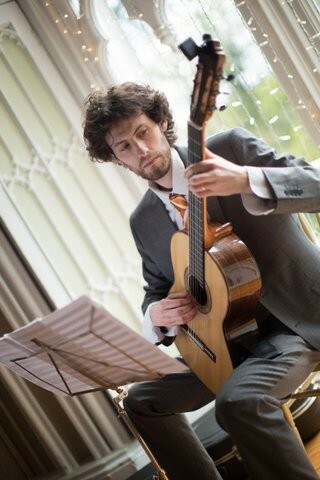 Eoin played quitar for our wedding ceremony on the 4th November 2012. He is a very talented guitarist. He offered a great choice & selection & range of music for our ceremony plus he also learned a few specific songs for us too which was really appreciated and which he played very well. We were very happy. Thank you Eoin. We had our civil ceremony in Moyvalley in October this year. The house for the ceremony was nice and intimate. Eoin played his classical guitar to perfection for us. It really set the mood and there were a few teary eyes. Eoin was very professional and easy to deal with which was one item less to have to worry about. He had a great repertoire and was very helpful for picking suitable songs. We'd recommend him highly. Eoin played at our church ceremony and also at our drinks reception in the Grand Hotel Malahide. The church ceremony was absolutley beautiful and Eoin was a pleasure to deal with. He was open to all suggestions, anything we asked him to play was not a problem and he also came with many brilliant suggestions hiimself. He created a beautiful atmosphere in the church and then jazzed it up at the drinks reception. So many guests commented on how nice the music was and I would definatley recomment Eoin for any style of wedding. Thanks a mill! My wife entrusted me with the task of arranging the music for our big day and after an extensive search for a classical guitarist to play our ceremony, I found Eoin and how glad am I that I did. The music was an extremely important part of the ceremony for us both. Eoin is the complete professional and gave fantastic advice on choices of pieces and can play both classical and contemporary which I wanted to mix together which can be a very difficult thing to get right. I had researched and listened to quite a few guitarists but nobody came close to approaching Eoin in terms of skill. He is extremely accomplished and his playing made the ceremony extremely special. The classical pieces during the ceremony were beautifully atmospheric and expertly phrased but my wife’s favourite part of the ceremony was us both walking down the aisle together as man and wife to his version of "Hear comes in Sun" which was fantastic and so uplifting. All of the guests commented on how good he was, especially those who were musicians themselves. My only regret was that we did not book him to play at our drink reception also. If you are looking for a classical guitarist like I was or are considering one, you've found him. I wouldn't hesitate in recommending Eoin as somebody who will make your day very special. Eoin played at the drinks reception of our wedding in the Royal College of Physicians in Dublin. He played a fantastic and varied repertoire of beautiful music. Everyone commented on the ambiance created by Eoin's deft fingerwork on the guitar. His reliability and easy-going nature along with his rare talent means we would greatly recommend Eoin to perform at any occasion. Eoin provided beautiful guitar music during our ceremony and also afterwards whilst our guests enjoyed canapes and champagne in the sunken garden at Castle Ward, County Down. He was extremely professional and created a very romantic relaxed atmosphere with his mixture of classical and contemporary music. Eoin was very easy to work with and open to suggestions, he played an instrumental version of our first dance whilst we were signing the register. His artful musicianship created a beautiful soundtrack to our perfect day.